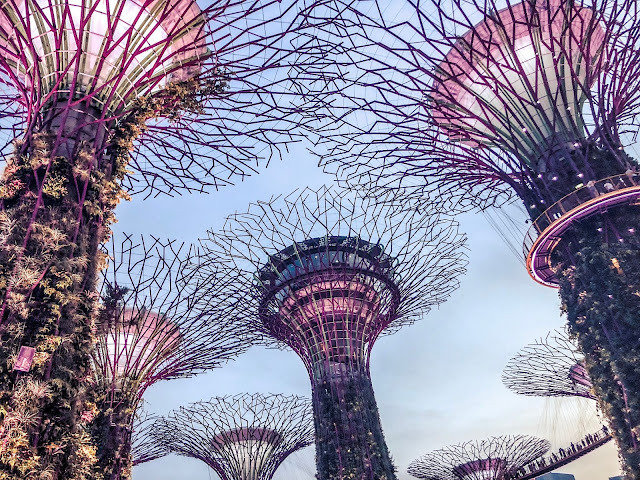 The most iconic images that come to mind when someone mentions Singapore are the huge and impressive Marina Bay Sands hotel and the futuristic Supertree Grove at Gardens by the Bay. I would highly recommend that you make this area a first priority on your 48 hours in Singapore and if you have just one day, spend it exploring this area. Marina Bay Sands (MBS) is a huge hotel with 2,500+ rooms spread across 3 towers of 55 storeys each, said to be inspired by decks of cards. 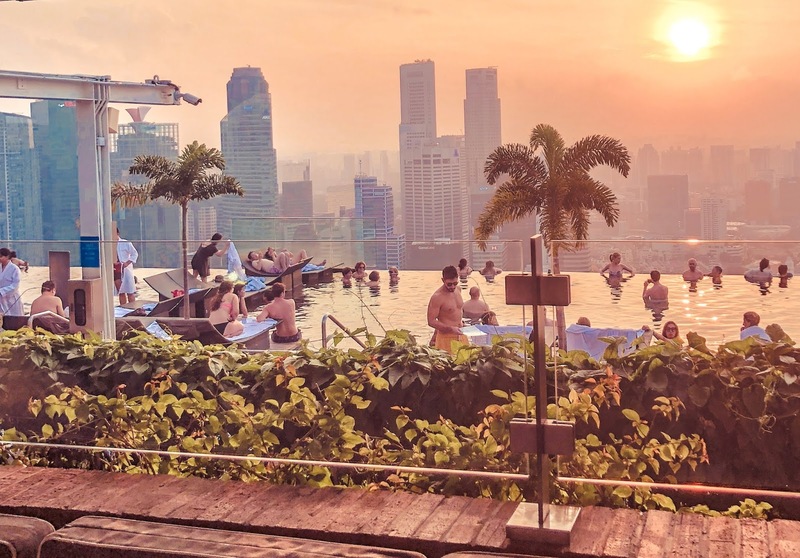 They are topped off with an inter-connecting Skypark, housing the world's longest infinity pool which you have probably seen all over Instagram! 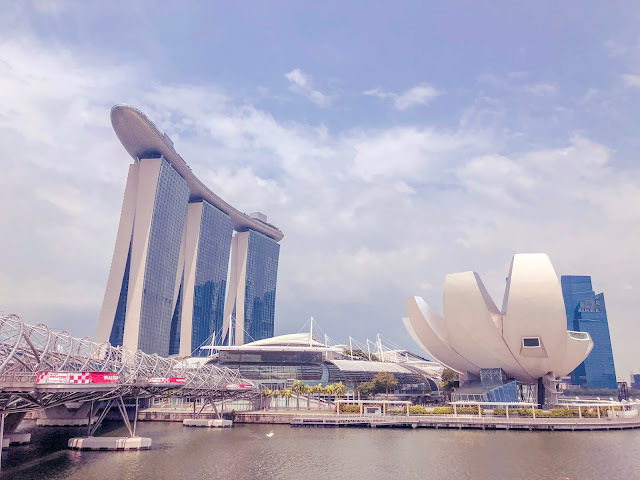 I think the Skypark looks like an aeroplane or a rocket, but whatever the inspiration behind the design it will not fail to impress you as soon as you see it in person. I didn't get to stay at Marina Bay Sands unfortunately but had the most fantastic meal at the restaurant next to the pool, Spago, which I would highly recommend. The National Day fireworks were being tested the evening we were there and I remember feeling so happy and lucky to be living in such a magical place, having the best food I tasted whilst living in Singapore. Marina Bay Sands is a fantastic option for a hotel if you are willing to pay the high prices: I can guarantee that it will be one of the most memorable hotel stays of your life. 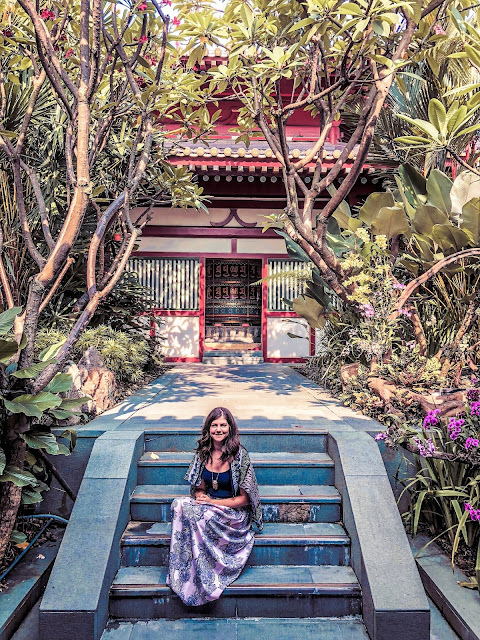 The Tall Wanderer, one of my favourite travel bloggers, has written a fantastic, comprehensive guide on whether it is worth staying at the hotel. I'd highly recommend reading it here if you are considering a stay. It is packed full of tips to make the most of your time if you do choose to splash out for a night at the hotel! 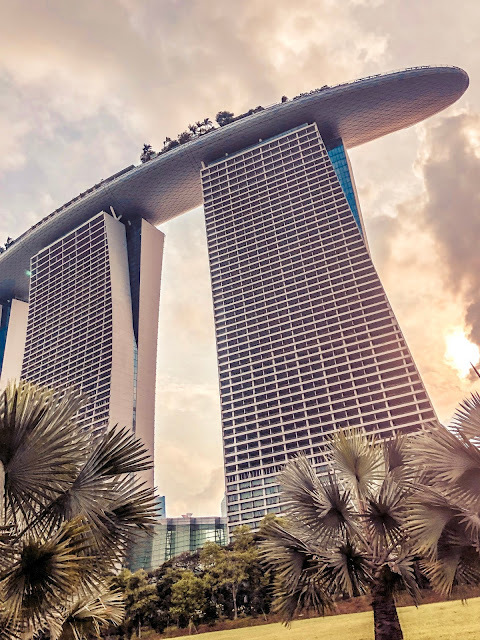 As well as being a luxury hotel, Marina Bay Sands houses a huge shopping centre, complete with a Venetian-style canal where you can get a gondola ride. The shops vary from top end designer to some more mid-range and there are a variety of dining options (albeit very expensive). I would advise visiting Marina Bay Sands first before heading to Gardens by the Bay as they are next to each other. I'd allow 1-2 hours to explore the whole MBS complex but allow longer if you are planning to do some proper shopping. Singapore is very humid so it is good to tie this into the hottest part of the day to enjoy the air conditioning. The shops tend to be on the high-end expensive side but there are some high street shops such as Zara and Bath and Body Works. 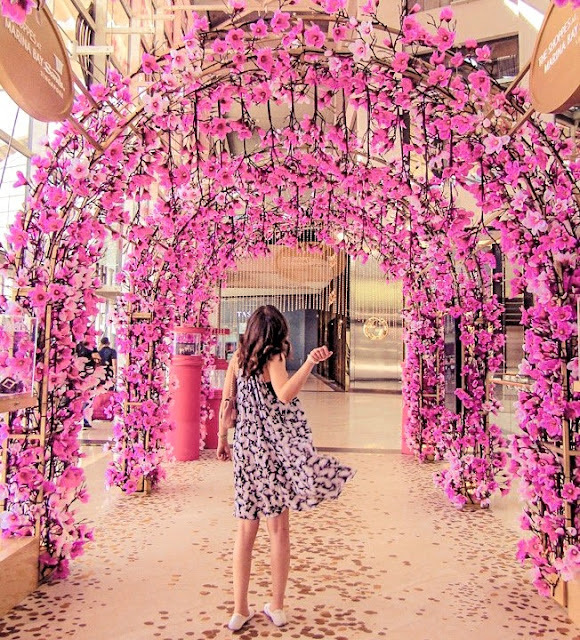 For those who enjoy a flutter there is also a casino within the complex but don't go there expecting complimentary alcohol like you would get in Las Vegas: Asian gambling is a more sober and serious affair. Also; don't try to joke with the security guy on your way in who checks your passport. He kept asking me why I was laughing, which made me laugh more (I was fairly merry after enjoying some drinks in Spago) and he really acted like passport control! You need your passport for the casino as locals have to pay a hefty fee to gamble here. International visitors are allowed to enter for free. I would always recommend carrying your passport when shopping in Singapore anyway as you can take advantage of a tax rebate on your purchases which you claim in the airport. The flower arches below were a pop-up feature last time I visited Marina Bay Sands, so it is worth looking out for similar photo opportunities whilst you walk around! For a refreshment break in the shopping centre I would recommend the TWG tea house. I will write a separate blog post about the afternoon tea here as it is truly beautiful. 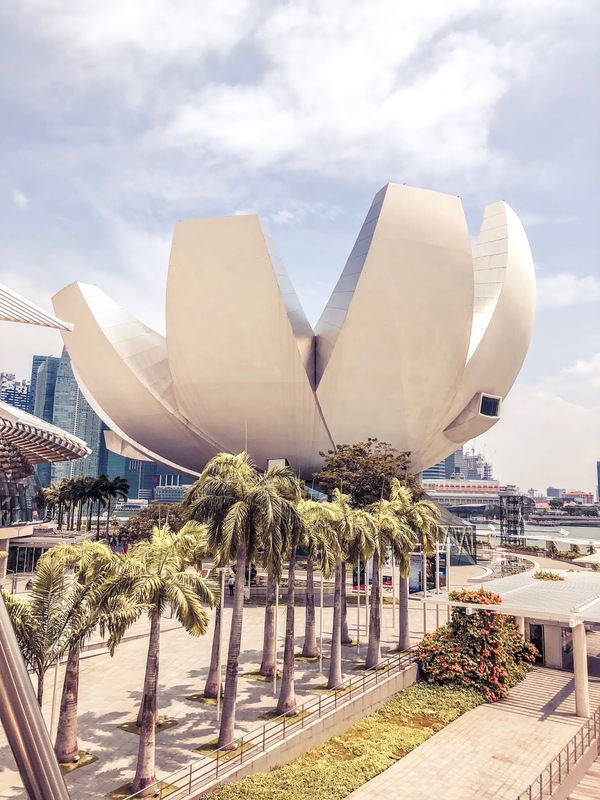 There are so many options for dining in Marina Bay Sands including an indoor version of a traditional hawker centre which is slightly more affordable than the formal restaurant options. Next on the must-do list is a walk to Gardens by the Bay. This green and unique place is great to see during the day, but it really comes to life in the evening when there is a light show. 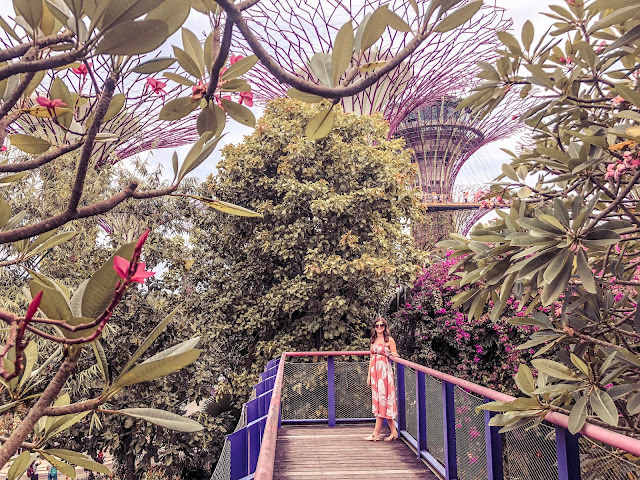 I would suggest walking down to Gardens by the Bay in the mid-afternoon after spending your morning and lunch time in Marina Bay Sands. It is a 10 minute walk from the shopping centre, just follow the signs and enjoy the impressive views over the gardens on your way. I would recommend paying for the shuttle bus from the Gardens entrance to get to the main attractions. The first time I went I skipped the bus, which is $3 for unlimited rides, but I soon realised it is very hot to walk through the Gardens to get to the various domes on offer and you don't actually miss much by getting the bus. The Supertree grove itself is free and has many intriguing nooks and crannies to explore. Make sure you venture beyond the actual Supertrees to see quirky sights such as the huge floating baby statue! Have a look at a map to make sure you get round the main sights as they regularly change. The Gardens are not under cover so try to do this during a dry hour or two if it's one of those rainy Singapore days. If you are hungry whilst in the gardens then I'd suggest try Satay by the Bay, a hawker centre packed with affordable local delicacies. 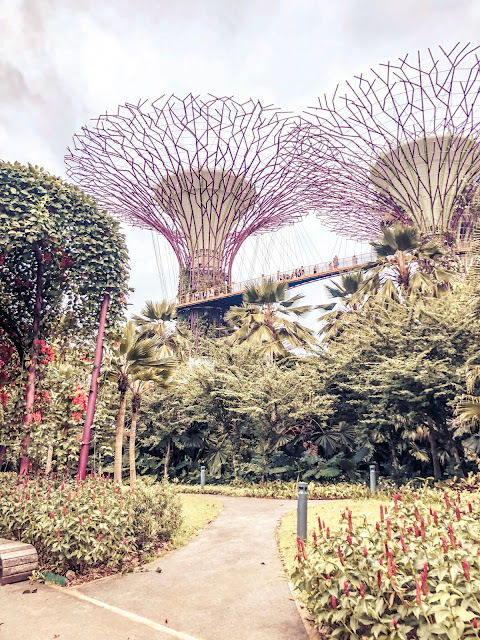 There are three other activities within the Gardens which are chargeable: The Cloud Forest, The Flower Dome and The OCBC Skway. If you are limited on time I would suggest prioritising the Cloud Forest (open 9.00am - 9.00pm daily) as it's an absolute must-see in Singapore and not like any other attraction. 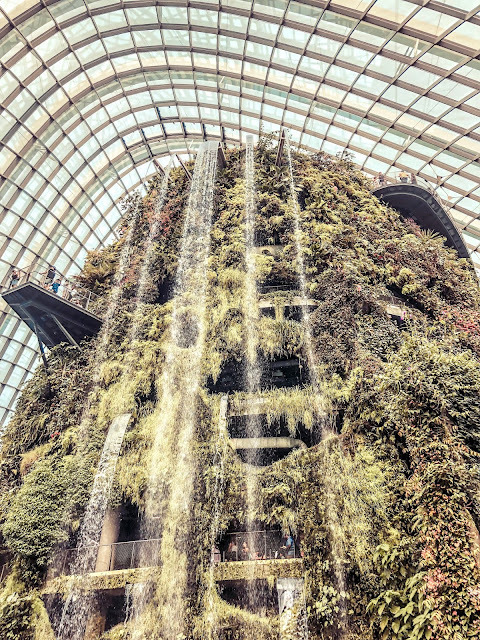 It mimics the conditions of a rain forest complete with a realistic indoor waterfall pictured below and the most beautiful air temperature which you will really appreciate to escape the humidity. I would make the Flower Dome your second priority. It is really beautiful and contains hundreds of flowers from different continents but if you have longer and plan to visit the Botanic Gardens on another day you will find some amazing flowers there. This dome is also open 9.00am - 9.00pm daily. You can pay for both domes priced at S$28, but I have a sneaky money saving tip for you here. Inside the Flower Dome there is a gorgeous restaurant called Pollen which is good for a drink if you need a break, various lunch options or a delicious afternoon tea (pictured below!). 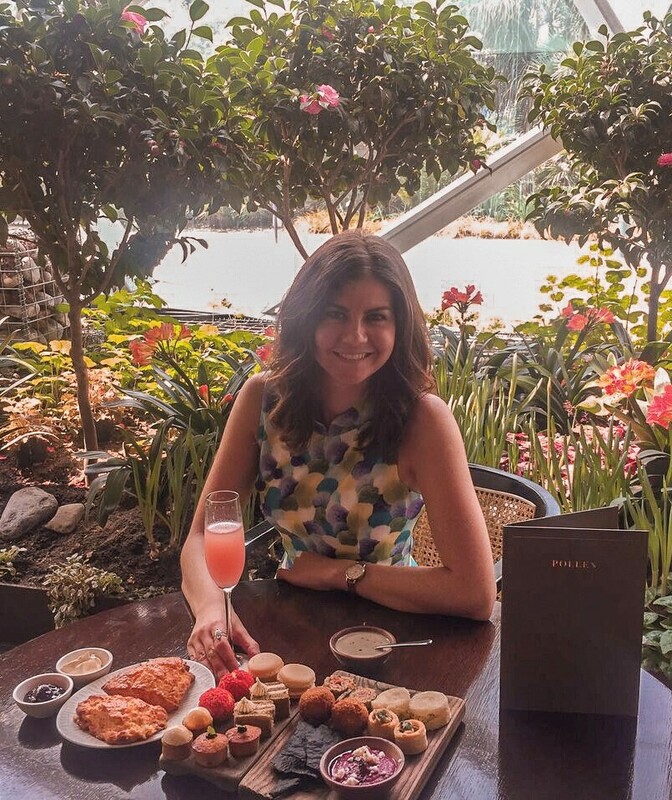 If you have a booking at Pollen you then get free access to the Flower Dome through a direct entrance so you could eat there and save your entrance fee for the dome (can you tell I am an accountant?!). Booking is always recommended as it is a busy restaurant - click here to book your table. After dark I would suggest heading back out to Supertree grove to watch the evening light show. Seeing MBS in all its lit up glory is something you don't want to miss! You have two chances to catch the show at 7:45pm and 8:45pm. Try to get there a little early to find a seat or you can join others lying on the grass. It feels odd at first but gives you a great vantage point! You could of course do the domes first, then wander round the gardens until the sun sets. The show consists of colourful lights dancing around the Supertrees in time to classical music. I have seen shows with a Disney theme and most recently an Opera theme: who knows what will be next! I would suggest you skip the OCBC Skyway walk shown in the very bottom corner of the photo above. You can get an amazing view from other places making this not as necessary as the other two paid attractions. Instead, I would suggest heading to Ce La Vi bar in Marina Bay Sands to take in the view from above. You could do this either at lunch time before heading to the gardens or after the evening show, depending on whether you'd prefer a daytime or night time view. There is a steep entrance fee of S$22 but the cost is redeemable against drinks. If you pay S$25 to visit the viewing deck which is in the same tower as Ce La Vi then you are at a lower vantage point and don't get to use the cost against any drinks so I would suggest choosing the bar if you plan to have a drink. This picture was taken from the bar on an evening and shows the view over the viewing deck below. This might help you decide which to go for. If you manage to get through everything I have mentioned so far then you have certainly seen the highlights of this area in one day but I couldn't write this guide without mentioning one more attraction. If you are more into museums and modern art than shopping then I would recommend The ArtScience Museum, next to Marina Bay Sands, as a great place to squeeze into the same day. The exhibitions change regularly but you can click here to see what's on. This is a great activity for children and teenagers but there is plenty for adults to enjoy as well! It's yet another attraction that showcases how far into the future Singapore really is. To experience the incredible diversity of Singapore I'd recommend a visit to the iconic Chinatown for your second morning. There are affordable souvenir shops scattered all around Pagoda Street which is right next to the MRT (Singapore's underground transport system). It is worth buying any gifts for family and friends here as the airport is very expensive. Just walking around Chinatown and taking in all of the different colours, sights and sounds is an activity in itself. 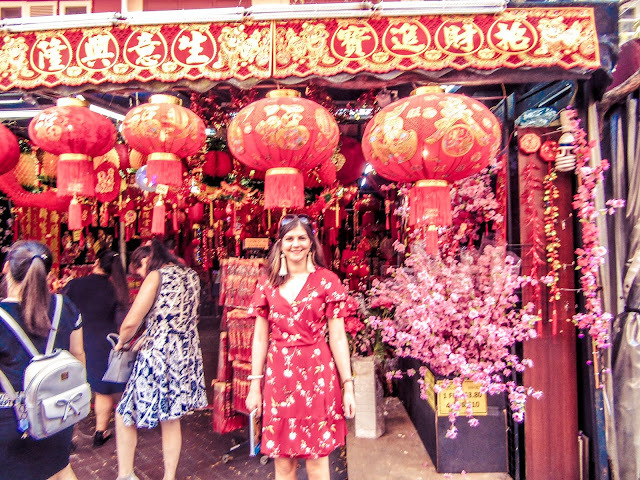 From stalls selling fresh pig trotters to beautiful red paper lanterns hanging above you, Chinatown is a hotpot of culture, colour and experiences. There are also countless options for dining in Chinatown so you won't go hungry. If you are a museum fan, the Chinatown Heritage museum is a great place to visit. Allow around an hour to see this as it is quite small but gives an amazing overview of the history behind Chinatown, the original migrants to Singapore and the history behind the iconic shop houses which you will find all around the city. 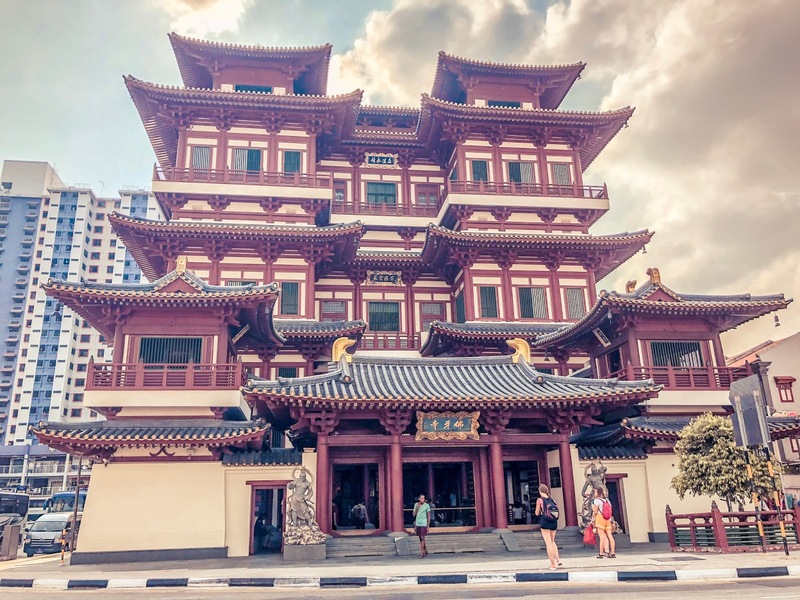 The highlight of Chinatown for me has to be the Buddha Tooth Relic temple. I have spent so much time visiting temples in Asia recently and I still always say that this one is my favourite. I will never forget seeing it for the first time and being blown away by the details, colours and thousands of tiny Buddha statues all around the walls. You will need to be covered up but shawls are available to borrow. You are also required to remove your shoes so bear that in mind when selecting your footwear for the day. My top tip for this temple is that it has the most beautiful hidden roof garden! Just before you enter the temple turn right and you will find the lifts. If you take the lift to the top floor (there are also stairs), then turn immediately left, you will go up a final flight of stairs that leads to this quiet oasis of peace and tranquillity. All the floors of the temple are worth exploring and it is a truly stunning and unique place! Please be considerate when entering the hall on the top floor which contains the tooth of Buddha. You are not allowed to take photos and this is made very clear with signs and a guard reminding you yet every time I have visited I see people taking photos. I have seen the guard forcing people to delete photos in front of him so please take this rule seriously. You are free to take photographs of the roof garden, as pictured below. After exiting the temple, cross the road, turn right then turn left round the corner and you will find Maxwell Hawker Centre. This place does the best chicken rice in Singapore at the stall Tian Tian Chicken Rice. Don't miss the opportunity to try this local famous dish and any other authentic food you may wish to try in your limited time! 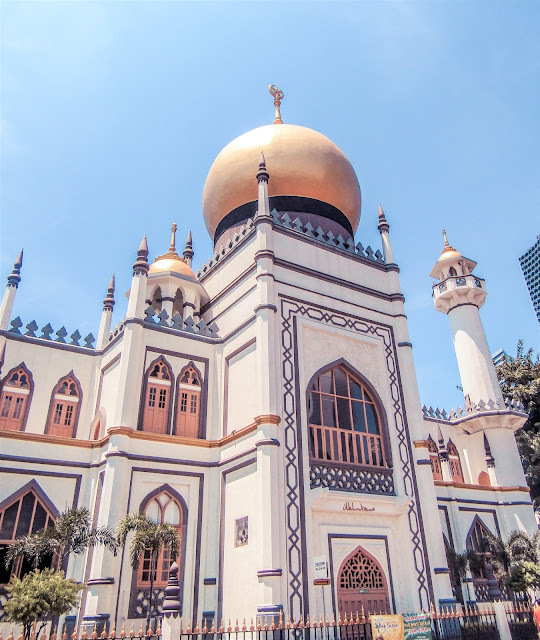 Another place not to be missed on your second day is the area around the Masjid Sultan Mosque on Arab Street. You will find it hard to believe that you are in the same country as Chinatown. You can enter the mosque but its real beauty is to be seen from outside as you walk down Arab street to take it in. This is probably my favourite area of the country as I find it so exotic and interesting. The streets are full of colourful fabric shops, Lebanese-Turkish style restaurants and quirky street art. The restaurants are nice but being of Turkish descent I would be picky and say they aren't 100% authentic, more a mix of Lebanese and Turkish. I would still recommend going to any of the restaurants as I have taken visitors who have really enjoyed eating there. I'd recommend heading to this area in the mid afternoon which will give you enough time to see the mosque in its daytime glory. There is an ice cream shop called Lickety which I love for mid-afternoon ice cream and waffles. 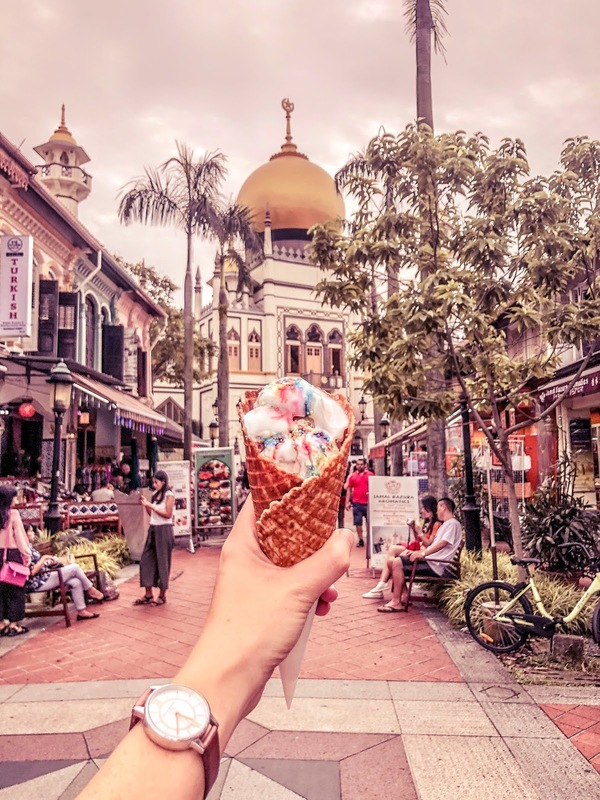 Haji Lane is five minutes away from Arab Street so can be visited at the same time. 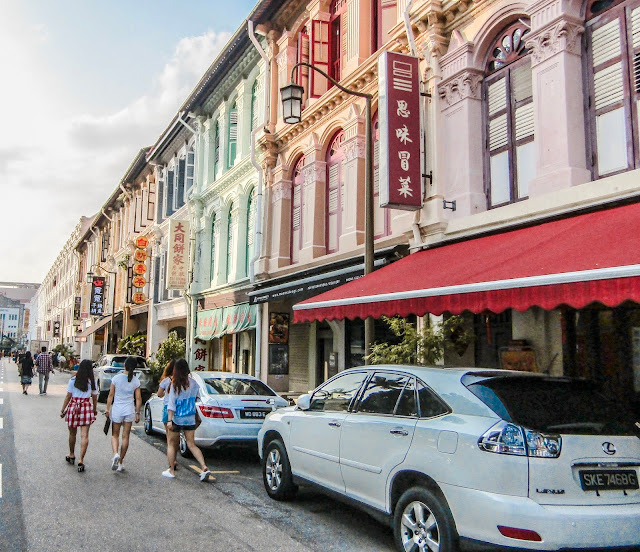 It is a great place for quirky, independent shopping in the afternoon followed by an evening spent soaking up the relaxed atmosphere of this area as the sun sets. It is a very trendy and hipster area which reminds me of Shoreditch in London. It has a more European feeling about it than other parts of Singapore. 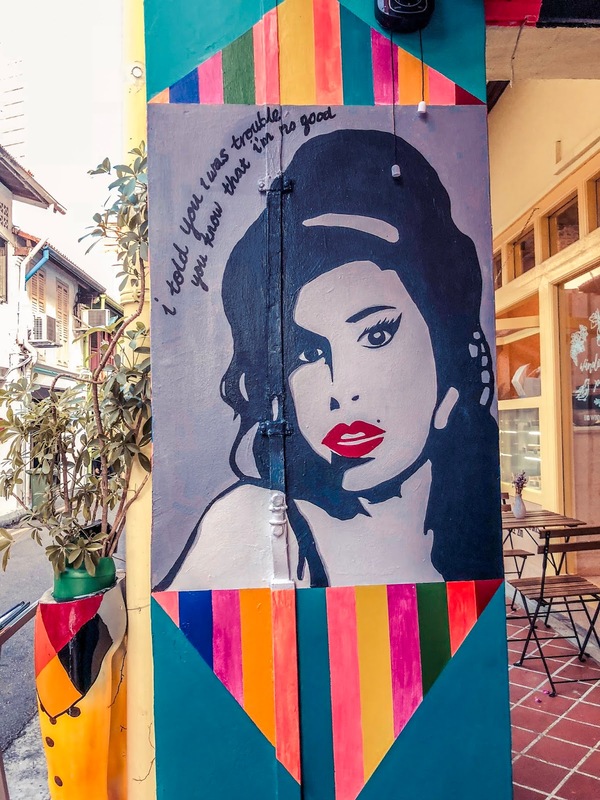 The street art on Haji Lane is not to be missed: just head past selfie coffee on your right (yes, you can get your face printed on your coffee if this floats your boat!) 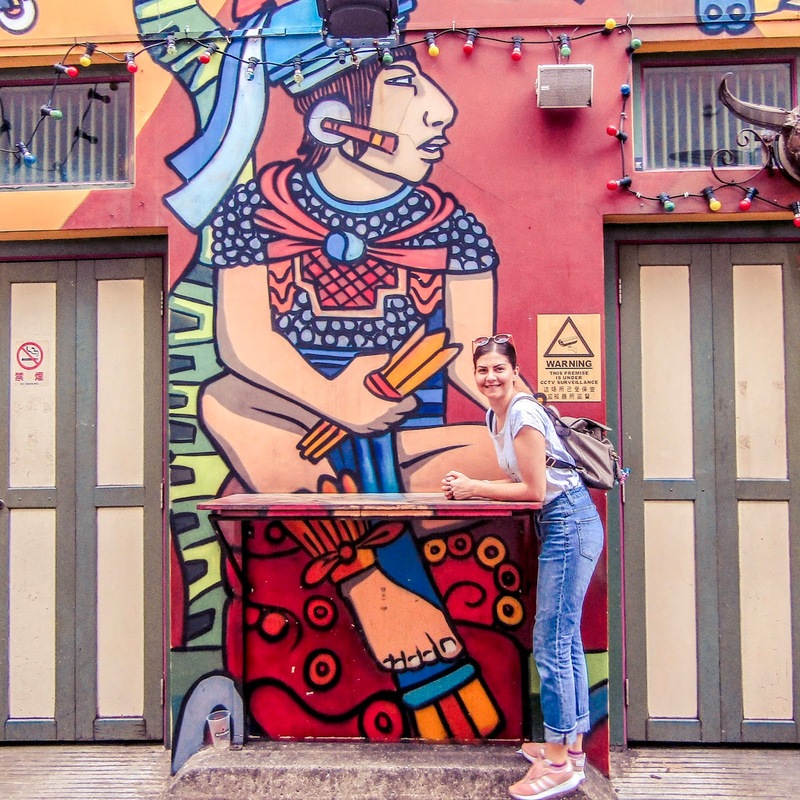 and you will see the main street with art murals, regularly dominated by Instagrammers like me! There are a number of Western cafes, bars and restaurants on this street and the parallel Bali Lane. Whichever you choose, the food and drink is pretty good and there are usually some happy hour deals on offer. To get a more Lebanese or Turkish style meal just make your way back to Arab Street where there are countless options to choose from. Hopefully this whistle-stop tour of Singapore will give you a taster of how diverse, futuristic and amazing it really is. If you are visiting for longer or want to read about some alternative things to do whilst visiting, stay tuned for my guide to longer stays! 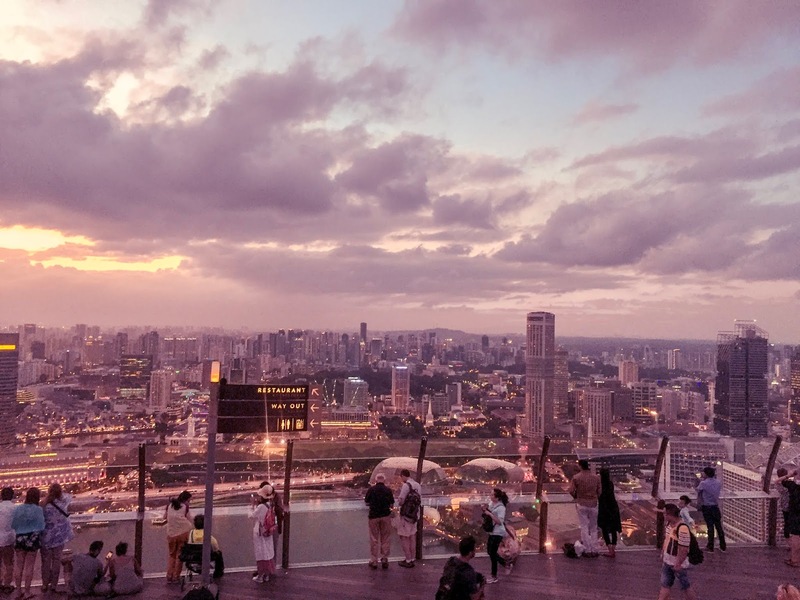 Have you visited Singapore? Let me know in the comments below! Thanks so much, I hope it helps you to make the most of your stay! Wow! I missed so much in Singapore - I'll have to go back. We stayed just around the corner from the Budda Tooth Relic museum but didn't go in! I can't believe we missed that roof garden! Also, great tip on visiting Ce La Vi bar over the Sky Deck if not staying at MBS. Thats the kind of tip you only pick up after living somewhere. This is a great guide - thank you. Oh no the roof garden is such a cool little place! You can't do it all though, and seems like you managed to fit a great deal into your trip. You're right though about picking things up when you live there - one of my expat friends told me about the roof garden otherwise I would've missed it. Definitely somewhere to go back to. Thanks! Ahh thanks what a lovely comment, I am glad you enjoyed reading! Thanks so much, I really hope it helps! ooohhhh the Arab street is so pretty! It;s so picturesque! Thank you, it's a really lovely place!